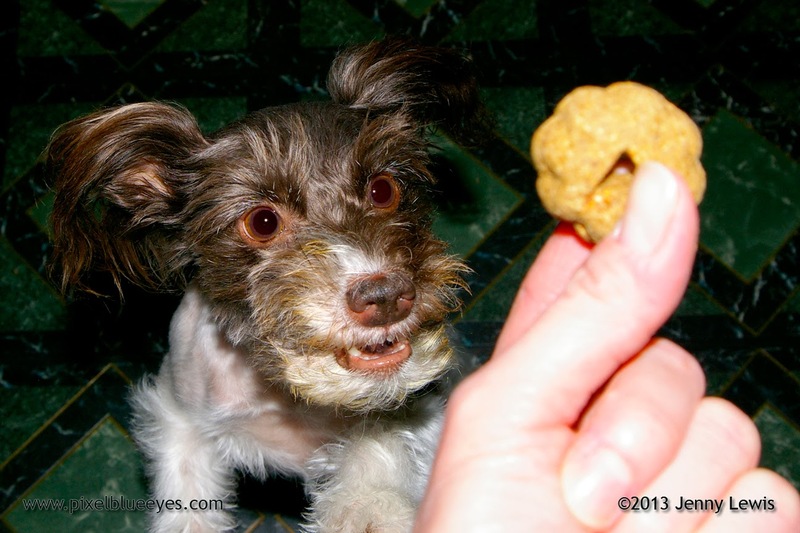 The Joy of Giving and Being Thankful - Pixel Hosts a Hill's Treats Giveaway! My dear friends, as the holiday season approaches, with Thanksgiving just around the corner, I can't help but think of all the things I'm truly thankful for. I have the most wonderful Mommy & family who loves me beyond measure; I have two extra special fur sisters whom I adore; I have a good vet who helps keep me as healthy as possible; I have lots of wonderful friends whom I love sharing with; I get to eat really good food everyday; I get to blog about my adventures and joys with people from all over the world; I have the best collection of toys a girl could ask for; and I get to be spoiled with special treats everyday. Oh, I could go on and one, but that gives you an idea of why I am so thankful. The treats that I have fallen in love with are my Hill's Ideal Balance Oven Baked Naturals. Oh my goodness, they are so yummy-licious! I remember the first time those treats were delivered to my house, back when I first started blogging for Hill's. I could smell the yummy goodness even before they came out of the box! 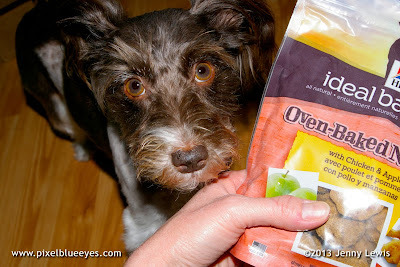 Mommy always wants to give me healthy dog treats, so she read the ingredients thoroughly and liked what she read. We could see what the treats looked like right through the front window of their very appealing packaging. Mommy likes that you can literally see the little chunks of fruit like cranberry and blueberry pieces in each treat. I like that they taste so good. Hill's Ideal Balance treats are all natural, and there's no soy, wheat or corn in them. And U.S. chicken is the number one ingredient! 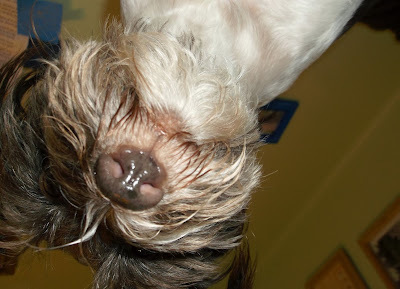 As you all know, I love doing my tricks with Mommy. We've trained for years mastering each one. Although I certainly can do them without treats now, Mommy always likes to give me little treats as a reward. She appreciates the fact that the Ideal Balance treats are easy to break up into smaller pieces, so I get several little treats that actually is only one treat. It makes me feel extra special getting so many little ones! 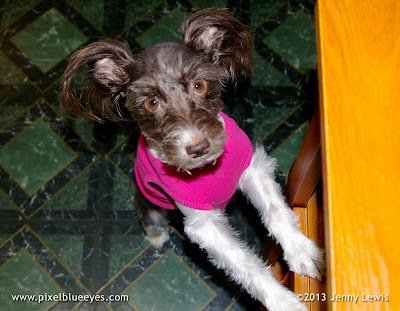 Sometimes I get so overly excited to do my tricks that I almost shout for joy as I do them! 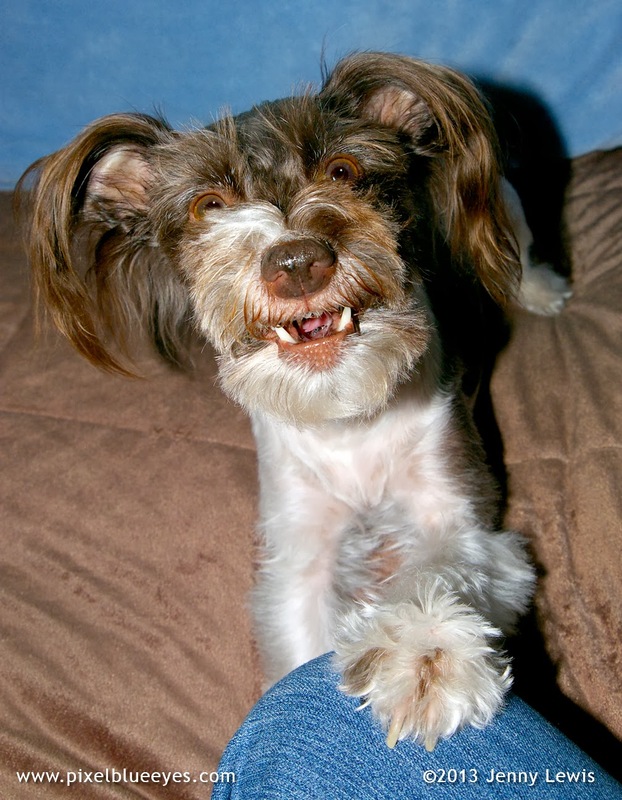 Here I am doing a combo of my "Paw" trick (where I give Mommy my right paw) and my "Smile/Sneer" trick (where I give Mommy my best toothy grin). Of course, I get a little treat after doing several tricks in a row...and what better treat is there than a healthy dog treat that is grain free and made right here in the U.S.A.? Would you like to see a video of me doing five of my tricks? I do love sharing my abilities with you, and it might just bring a smile to your face and laughter in your heart. Oh, and I guarantee that you will LOVE my "Pixel the Nascar Dog" trick video! All of this talk of giving great tasting treats is making me hungry for some, how about you? Would you like to try Hill's Ideal Balance treats for your dog or cat? If so, then I want you to enter my "Pixel's Joy of Giving" Ideal Balance Treat Giveaway, sponsored by Hill's Pet Food!! 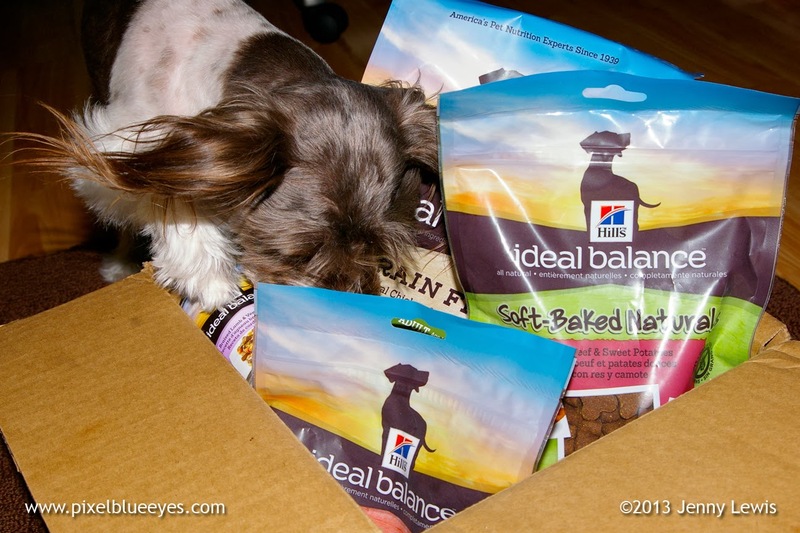 20 lucky winners will each receive 3 bags of either Hill's Ideal Balance dog treats or cat treats. It's very easy to enter, just follow the instructions below. 1. 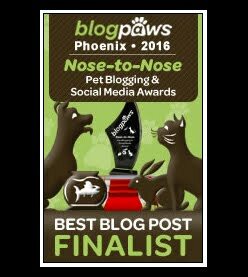 Follow my blog here by signing up with the "Join This Site" button to the right of this post (you might have to scroll to get to it), then leave a comment here on the blog post letting me know what you're thankful for, why you want to try the treats and whether you want it for cats or dogs. 2. 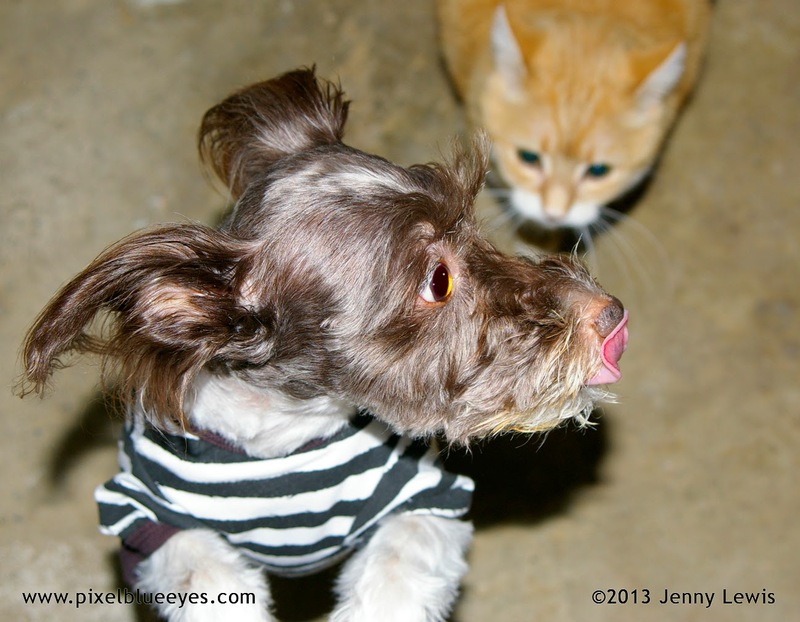 Follow me on Facebook by "LIKING" my page, then leave a comment on my Facebook timeline letting me know what you're thankful for, why you want to try the treats and whether you want it for cats or dogs. 3.Follow me on Twitter, then send me a tweet letting me know what you're thankful for, why you want to try the treats and whether you want it for cats or dogs. 4. 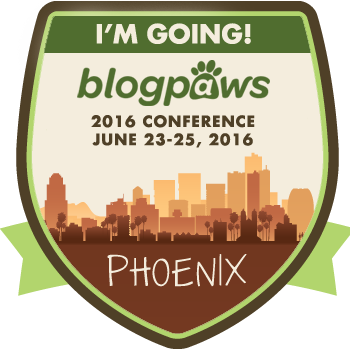 Share this blog post via Facebook or Twitter and make sure to tag me so I know you did it. 5. If you get one of your friends to follow me in one of these steps above, tell them to LET ME KNOW and I will enter YOU in the drawing again. Now don't wait to enter friends, you haven't a moment to lose! This giveaway is open to U.S. residents only and you must enter by November 30, 2013. I will announce the winners the first week of December. If you have won the previous Hill's Ideal Balance Gift Basket Giveaway, you cannot enter this one as we want as many different people to have a chance to win as we can. I think it is always best to give than to receive, so I can't wait to give 20 lucky winners a goody bag of treats. I hope each and every one of you has a wonderful Thanksgiving and Hanukkah holiday next week! Remember to try to always be thankful each day and to look for the joy in the little things in life. It makes life so much more enjoyable! "It's just another Monarch Monday, Oh-woe. I wish it were Sunday, Oh-woe. Cuz' that's my fun day! It's just another Monarch Monday!" Since it's from a group called the Bangles, that must be sort of like "bling", so wearing my Princess Pixel outfit seemed fitting. Since we're talking princesses and monarchy, I wanted to introduce a couple of other princesses I know. They are very sweet and nice and are humble in their Princess-iness. This is Precious Princess Hope. She is a very special girl who lives in Florida. She was born with some front paw limitations, but that doesn't slow her down from being the sweetest, prettiest Florida princess I know! Her Mom Sharon is super cool too, and even made me a beautiful purple animal print dress that is so pretty. They love each other so much! 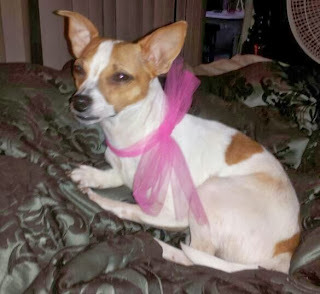 I know Hope would love to make some more friends on her "Precious Princess Hope of Northford" Facebook page. Go visit her sometime, like her page and get to know her. 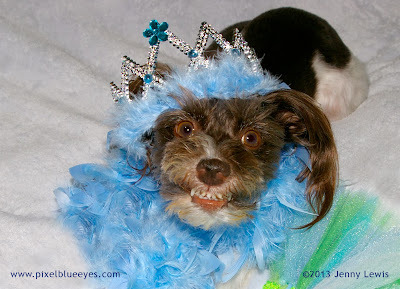 My friend Princess Ellouise is loads of fun too! 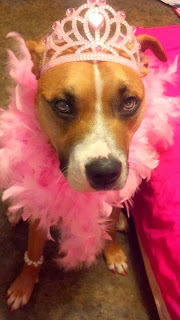 She's a beautiful pit bull Princess who is a great ambassador for the loving and noble breed. She is also silly and loves her Mommy Amy so much. They take great care of each other! 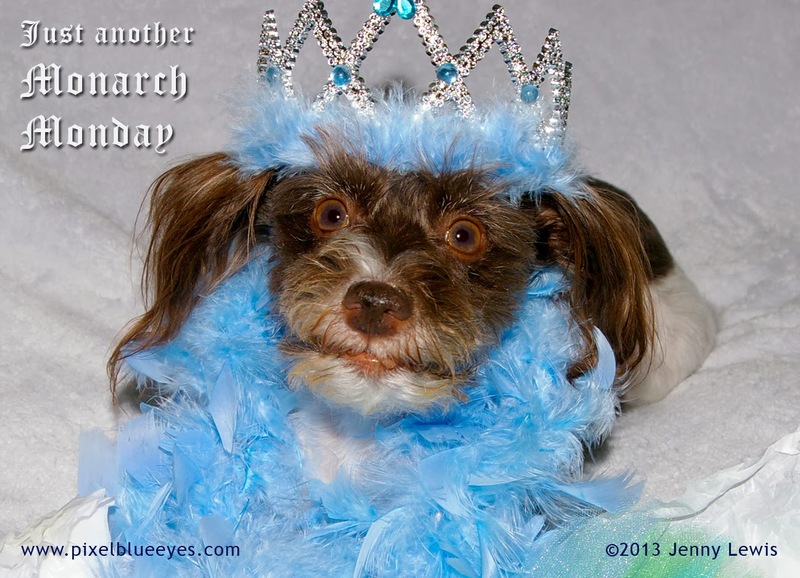 Princess Ellouise's Mom made me two lovely tutus and sent them with the tiara and feather boa I am wearing for "Monarch Monday" today. But don't let the tiara fool you, Ellouise is just as laid back as they come, just like me and Hope. I bet she'd love to make some new friends too. Visit her Princess Ellouise Facebook page and say hi! "It's just another Monarch Monday, Oh-woe! I wish it were Sunday....cuz that's my fun day....."
This Blog Hop is brought to you by Alfie’s Blog, Snoopy’s Dog Blog, and My Brown Newfies. I love to dance. 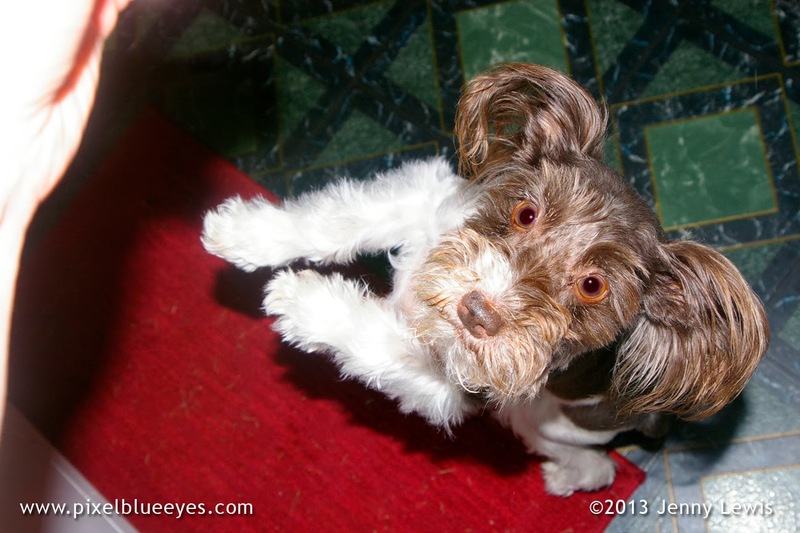 I find just about any reason to twirl around joyfully with Mommy. I think that dancing is such a joyful expression of your heart and soul. I believe I was born with the heart of a dancer. 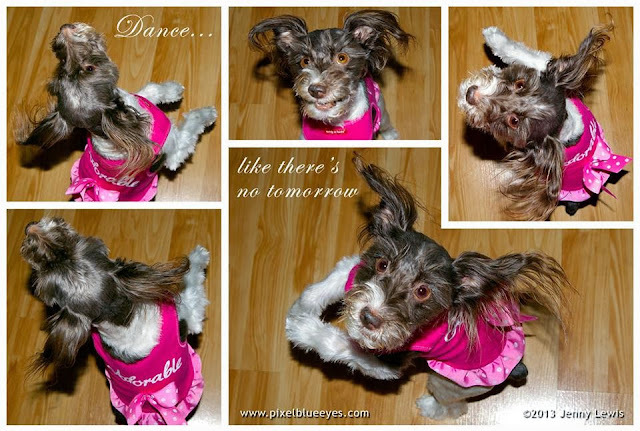 I didn't know it though until I adopted Mommy; then one day, clear out of the blue, I did a double pirouette twirl for her as though I was a prima ballerina. It made her so happy to see me do it, so I've been dancing for her ever since. It is an expression of my love. I dance for her. I dance for me. Do you dance? I hope you do. You can do it when you're all by yourself so no one sees, but I suggest trying it. It might just bring a smile to your face. Dancing has always been a joy for me and Mommy, and I hope it is for you too. My Pixel advice is simple: Listen to the music of your heart and dance. Find a reason to dance and just dance! I love you my friends! Come a little closer, I have something important to say. Perfect balance is very important in so many things. People need to have a balanced checkbook, car tires need to be balanced for safety, babies must learn to have balance before they can walk, good balance is ideal when you are dancing, and just life in general should be a good balance of work and play. The concept of balance is everywhere! I'm even balancing on this shelf to talk to you. 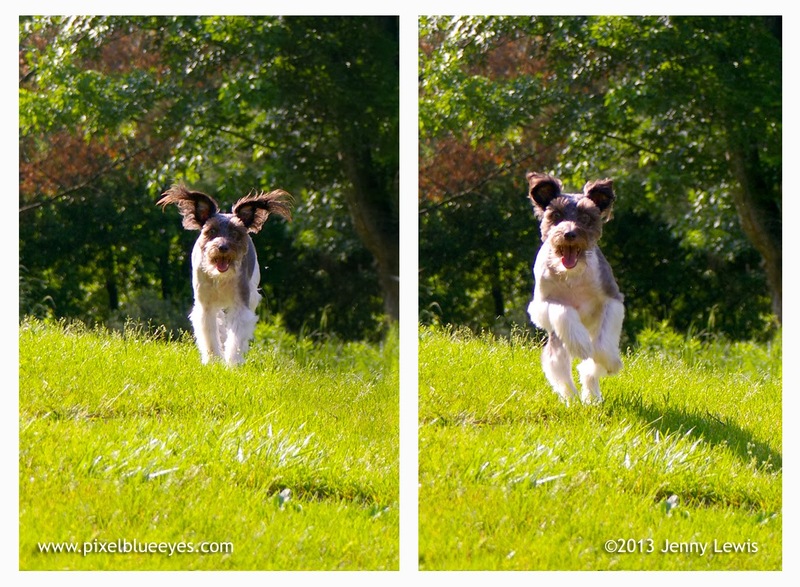 I love running as fast as I can, with my ear flying in the wind! Mommy talks a lot about having a balanced meal for the family, a healthy amount of protein, vegetables, carbohydrates, and vitamins and minerals that come from the food to help everyone stay healthy. 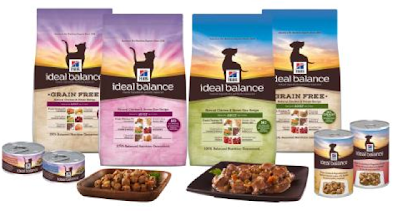 Of course, dogs and cats need to have balanced meals too. Since I love to run, I need to have a good balance of nutrients to support that kind of activity and exercise. I don't get to choose what food I get, so Mommy has to make sure that my meals are a perfect balance of key nutrients that my body needs to maintain good health, energy, and a proper weight. No, Mommy...I'm pretty sure I can open the bag by myself. Seriously though, I asked Mommy why precisely balanced nutrition is so important for me. She says that each vital nutrient, such as protein, fats, vitamins, minerals and fiber, has a specific job to do to keep my body in shape and nourished. Nutrient excess or deficiency can lead to a number of health conditions. Here are some of the key nutrients that are important for good health, and a brief explanation of what each one does for the body. 1. Protein helps support lean muscle tissue in adult pets, and helps nourish growing muscle tissue in puppies and kitties. A pet's body can only absorb a certain amount of protein though, so too much protein in a diet can stress the liver and kidneys as it tries to process it and get rid of excess nitrogen. Over time, that can have an effect on those organs. 2. 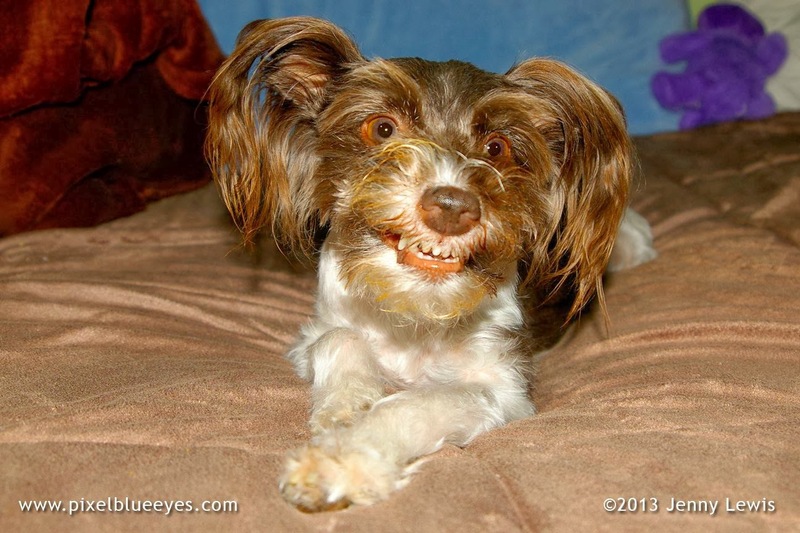 Fats, in the appropriate amounts in pet food, is excellent for healthy, soft skin and a beautiful, shiny fur. Too much fat in a diet can cause all kinds of issues like weight gain and blood problems, yet too little fat can be trouble too. 3. Fiber is great for healthy digestion, a healthy heart, and keep your cholesterol in check. Too much or too little can cause an upsetting imbalance in the intestines and cause unhealthy bowels. 4. Vitamins and minerals are essentials for so many reasons. Vitamins support the immune system. If levels are deficient in a pet food, fatigue or weakness can ensue, yet if vitamin levels are too high, organ stress can occur. Minerals help grow and maintain strong muscles and healthy teeth. Yet if mineral levels are too low or too high, serious health issues can arise. I've got the moves....cha, cha, cha! Hill's Ideal Balance natural and grain free pet food seeks out that perfect balance of these key nutrients for your pet...not too much and not too little. They use high quality ingredients in every recipe. As with any food, when ingredient quality increases, so does a pet's ability to absorb and use the nutrients for optimum health. Plus, it just might help them dance better, too. I mean, check out my samba...I'm workin' it over big time thanks to my healthy balanced diet! 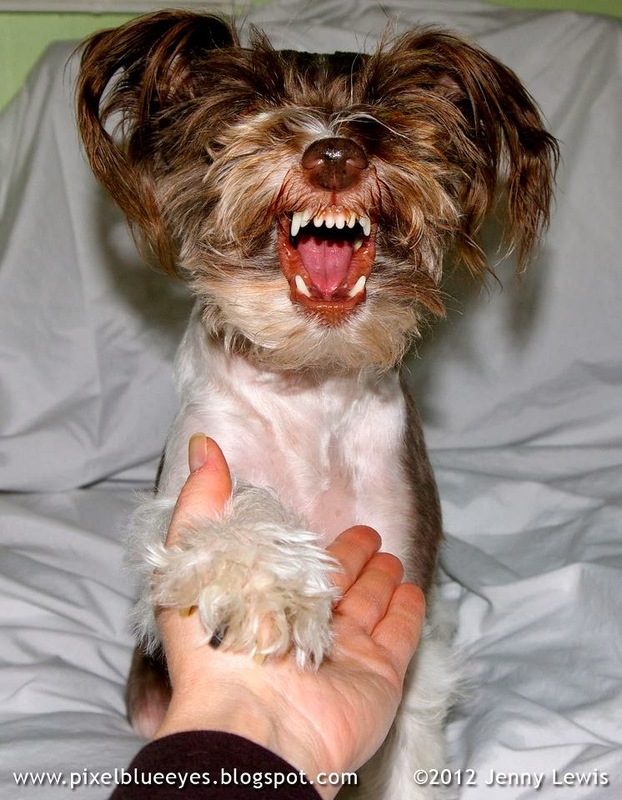 Now, all Mommy has to do is give me that treat! 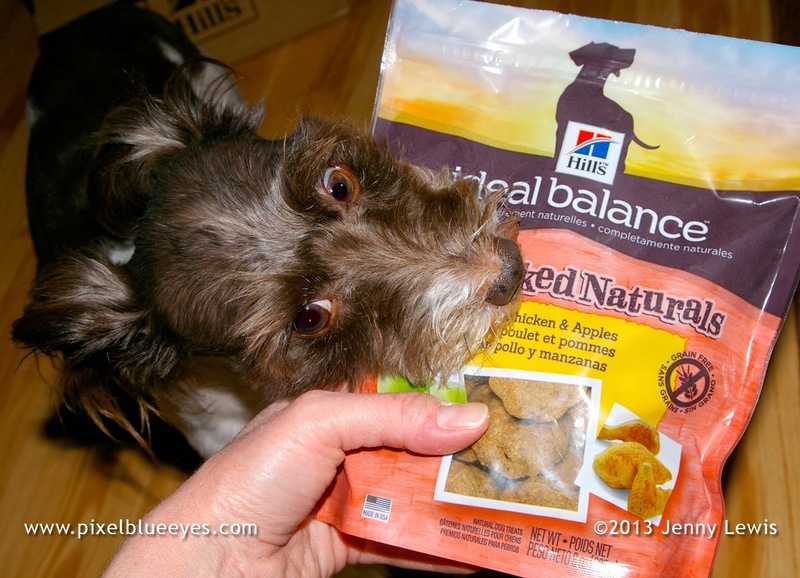 Are you feeding your dog a perfectly balanced nutrition? 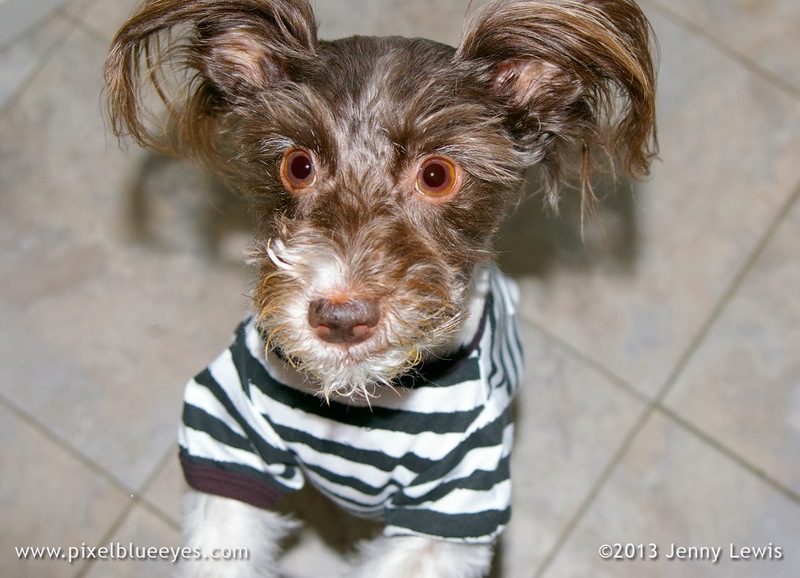 Find out if your dog's food contains properly balanced nutrition and how to make a change if it doesn't. I invite you to the Hill's Ideal Balance website and do a self assessment of your current food vs. Hill's Ideal Balance. 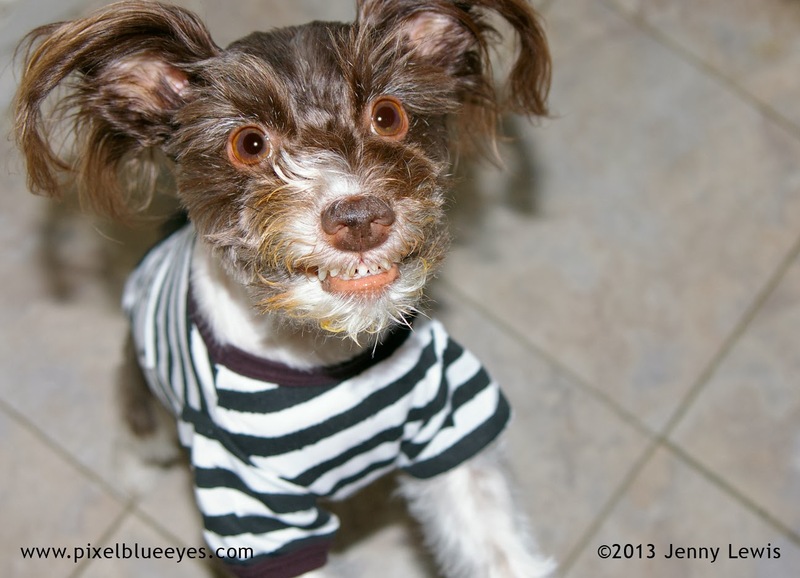 They also did their own comparison of some of the biggest dog food brands and share their findings here. Just remember, whether you are seeking the right food for your pet, or seeking to master the perfect twirl, BALANCE IS THE KEY. 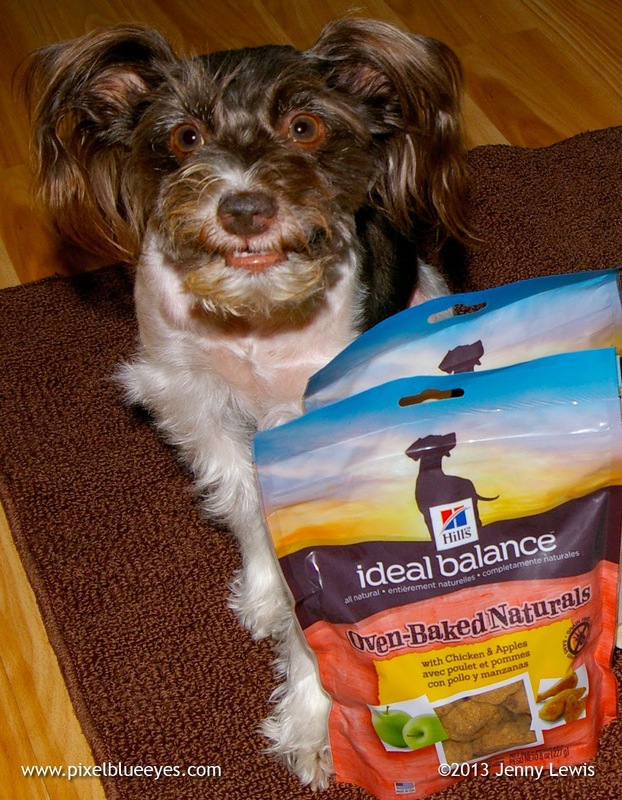 Would you like to try Hill's Ideal Balance for your pet? I say, go ahead, give it a whirl!! Or should I say give it a TWIRL! You'll be so glad you did. A healthy, balanced, nutritious diet helps Pixel joyfully twirl all day long! 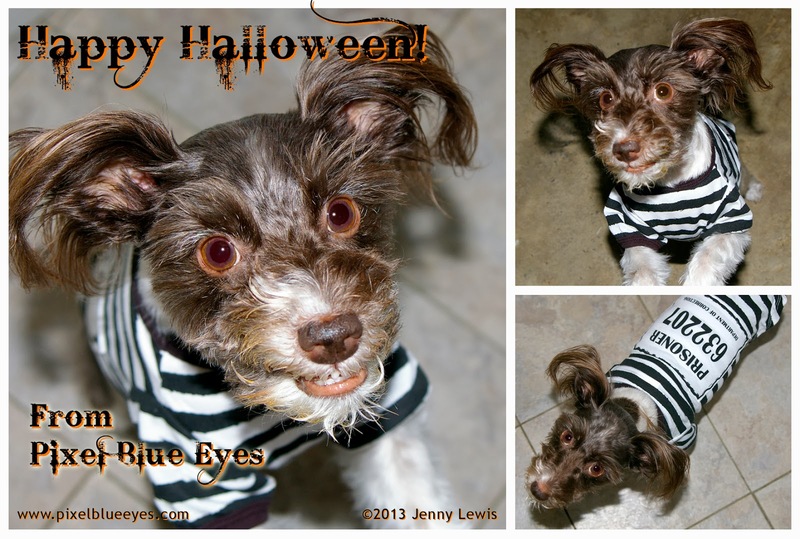 Happy Howling Halloween friends! 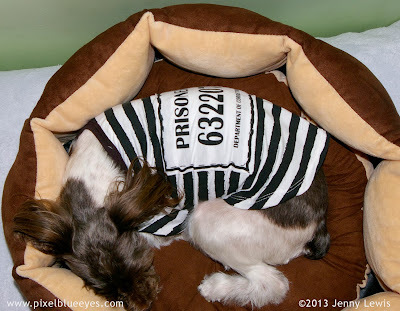 They say that prison changes a dog, but I'm still the happy, joyful Pixel I've always been. Mommy says I'm the best cell mate she's ever had, which makes me wonder....should I do a background check on her? And where is HER prison shirt? BOL! I really don't mind being in-car-cerated, as long as Mommy drives and I get to look out the window. They feed me well here, and I get along with everyone too. There's this one fellow inmate though, they call her Meow Meow. She really likes to come up close and rub against me. That makes me feel uncomfortable. I think I will have to tell the warden about it. Maybe Meow Meow is just sick & tired of me stealing her food...but I haven't stolen it in weeks! The accommodations are quite comfy. The beds are incredibly comfortable, I get yard time, access to a computer (which is why you are reading this now), and I still have a nice stash of toys. All in all, I really can't complain. Mommy even said they might let me out early for good behavior! Now, you might ask yourself, "How in the world did little Miss Pixel get to be an inmate?" Well, this innocent, pumpkin covered face will never tell. Okay, maybe I will tell...I'm a prisoner of LOVE!! I love my Mommy and she loves me, so I am locked up in her heart forever! And gladly so.